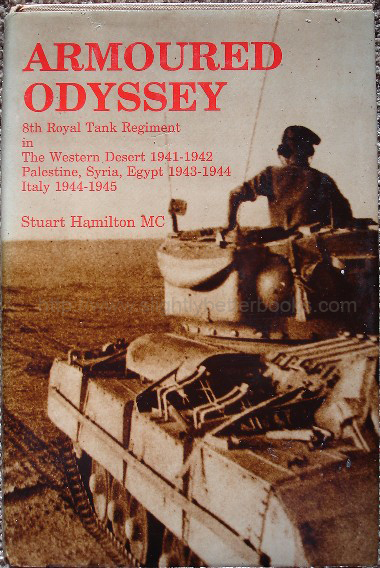 About this book/synopsis: Stuart Hamilton wrote this book because he wanted to record what it was like to be a member of a tank crew in the heat and dust of battle in the Western Desert and in the arduous terrain of the Italian campaign and this is his gripping account of his service as a tank commander with the 8th Royal Tank Regiment in North Africa, Syria and Italy with the 8th Army. At the end of the war he was still with the Regiment he had gone overseas with in 1941-one of only three of the original officers to survive. About the Author: Major Stuart Hamilton MC enlisted in the March of 1936 in the Royal Tank Corps at Bovington Camp, intending to obtain a cadetship to Sandhurst from the ranks. This was going to be a difficult task, since only 30 cadetships were granted each year. In 1937, he joined 5th RTR at Perham Down, only to meet misfortune in 1938 when he was badly burned in a tank accident and hospitalized for four months. Later rejoining 5th RTR, he requested an interview with his Colonel-in those days you just didn't do this-and asked what had happened to his application for a commission. The answer was that it had been filed and forgotten. As it turned out, he was recommended for a cadetship at Sandhurst in September 1939, but war broke out and prevented him from taking this up. Instead he went to an OCTU and was commissioned in July 1940. 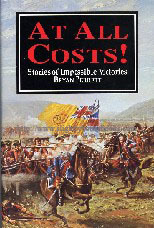 About this book/synopsis: Published in 1993 by BCA in hardback (with dustjacket), 223pp, this volume looks at 11 true stories of the battlefield - each a testament to exceptional bravery in the face of superior odds. In each case, the situation was desperate, the objective dangerous, the odds against success dauntingly high. The 'at all costs' mission on the battlefield is usually brought about by the desperate need to attain an objective or maintain a current position, whatever happens and is often inspired by motives as diverse as a desire for survival, revenge, personal gain, professionalism and self-sacrifice for the greater good, or for a cause. Put a troop of soldiers in this position and it can inspire examples of human bravery above and beyond the call of normal duty -some would say beyond sanity. Published (and written/compiled?) 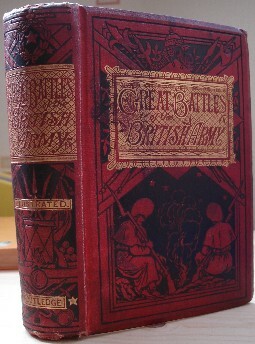 by George Routledge and Sons in red cloth hardback, publication date unspecified, but likely to be about 1870, 565pp. Contains six chromolithographs. The frontis one has a tissue cover. Contents/synopsis: Initially an unlikely soldier, the young Guy Bransby finally determined that he wanted to fight for the Western Ideal-at the front lines. Since that time, he has served in Vietnam, Cambodia, Kashmir, Northern Ireland and the Falklands-the only British soldier to have fought in all of these campaigns-and has totalled nearly six years in military action. Few would argue that he has not achieved his aspirations. 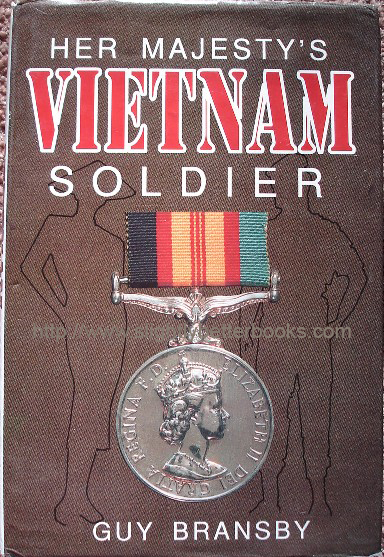 In this book, the first of a trilogy, Bransby describes his training in the UK, his eventual compulsion to fight in Vietnam and his service out there as one of the few participating British soldiers. It was on the expiry of his contract with the RA in Germany in 1969 that Bransby resolved to serve in Vietnam. To do this, he joined the Royal New Zealand Artillery and, after a few months as an instructor in Papakura Auckland, he was posted as an Artillery Forward Observer with the ANZAC infantry in the Phuoc Tuy province of Vietnam. He served there for nearly 1 year. In 1971, Bransby returned to Vietnam as a Green Beret (the US Special Forces) in the Binh Dinh province, where he met with a totally new kind of war, perhaps more horrific than any other seen in the 20th Century. With an irrepressible sense of humour and a strong empathy with human nature, Guy Bransby survived the Vietnam War and rightly earned the respect of American and Colonial Forces. Although he comes across as a whimsical and eccentric Englishman, his story unfolds itself on the battlefield itself telling of comradeship, heroism and horror... and "Dear John" letters; so his style is not the normal "tough" style of war reporting and storytelling. Guy Bransby was born in Esher, Surrey in 1942 and was educated for the most part at Ottershaw, a boarding school in Surrey. When all the allied troops left Vietnam in early 1973, Guy Bransby went back to New Zealand to continue his job as instructor. When the India-Pakistan conflict blew up about Kashmir in 1974, Bransby found himself posted to the NZ contingent serving with the UN military mission to that conflict. He remained there until 1976. After 1976, he was in Fiji and New Zealand, returning to Britain in 1980 when he joined the Royal Air Force Regiment. He then served in Northern Ireland and in 1982 in the Falklands War. About this book/synopsis: When the Falklands War erupted into existence in early April 1982, it was such a surprise that for many people they can name what they were doing at the time the news broke. There have been many opinions and books written about the Falkland's War, but Nicholas Van Der Bijl's account is set apart by its objectivity - Van der Bijl served with the Intelligence Corps 'down south' in the Falklands and this gives him the ability to expertly examine and comment on the Argentinian's strengths and weaknesses, and this makes the book a thoroughly balanced work not only using the author's own experience but combining it with the vast quantity of research he has unearthed on the subject. The major battles of the conflict that led up to the British victory are described in a very readable and authoritative way; and he does not pull any punches or preserve any sacred cows - and this is very evident in his graphic description and assessment of the SAS attack on South Georgia. 4. Some are reprinted for the first time since their original appearance - e.g. the Oxford soldier's journal, not seen in print from 1770 to 1977 when this book came out. About this book/synopsis: "If any gentlemen, soldiers or others have a mind to serve Her Majesty, and pull down the French king; if any prentices have severe masters, any children have undutiful parents; if any servant have too little wages, or any husband too much wife, let them repair to the noble Sergeant Kite, at the sign of the Raven in this good town of Shrewsbury..." Such patter of the recruiting sergeants could be heard in the market squares of Britain throughout the century and a half (1750 - 1900) covered by this book. Attracted by the prospect of adventure, of a steady -if small- income and a fine uniform, men flocked to the army in their thousands. There, despite the low pay and the meagre food, these raw recruits were transformed through constant drill and severe punishments into the soldiers that fought in the American War of Independence, in the campaigns against Napoleon, in the Crimea and in numerous small colonial wars. Roy Palmer has brought together songs and ballads from the period, and interspersed them with the writings (from letters, memoirs, etc) of many soldiers, as well as contemporary prints, and photographs, to give a vivid first-hand account of life in the lower ranks at this time, answering the question - what was life really like for the common soldier? What did they go through? What were their thoughts and emotions; what was life at this time really like? Extracts are taken from the work of twenty-nine soldier-writers. All served in the ranks, though two became officers. A few - Cobbett, Somerville, Blatchford - later made a living largely by the pen, but most remained obscure. Several are anonymous, and we know of them only from what they have written. Unless much has been lost or remains undiscovred, it seems that few rank and file soldiers of the 18th Century wrote of their experiences. However, the revolutionary and Napoleonic Wars produced a mass of writing, much of it published during the succeeding ten or twenty years. Perhaps social change and a shift in taste produced a market for such work. The important thing here is that once established, the pattern continued throughout the 19th Century. A great deal was written about the Crimean War, the Indian Mutiny and the numerous colonial "small wars", as they have been termed; with the two World Wars of the 20th century seeming to produce far less material [this point of view is as of 1977; much has been published since then]. Much of the material (e.g. Coppard's) in the book was not written with publication in mind; rather it came from private diaries, journals or family papers which only came to light due to chance discovery or meticulous detective work by researchers looking for true accounts from those who were there at the conflicts in person. Private Metcalfe's chronicle of his service in India during the time of the mutiny was not published until nearly a century after he had written it. Such writings are often honest, unpretentious, starkly direct; sometimes bitterly critical and staunchly patriotic at the same time; men that are fighting, yet long for peace at the same time. Men who endure the horrors around them - fighting to survive; and coping with fatigue, hardship, sickness and danger. This book also covers music about military life- a lesser known side of the army. Many people are aware of and know the music that accompanies marching, drills and perhaps even battle, but actual songs about the life of a soldier are not well known; yet such music is very important to soldiers. There is a sub-culture of music based on parody; revealed by such works as John Brophy and Eric Partridge's 'The Long Trail: Soldiers' Songs and Slang 1914-18' (1965, Deutsch) and the production 'Oh, What a Lovely War' [also in book form]. Readers interested in the songs should also take a look at Lewis Winstock's book 'Songs and Music of the Redcoats 1642-1902' (1970, Leo Cooper), which looks at materials actually sung and played on the march, in camp and occasionally in combat. It is believed that some songs were actually written for and by civilians and show the relationship between the soldier and the society he/she serves. Readers should note: Some of the songs are from before the period covered by the book, but are current during that period; others originate during the period, but continue after it. The narratives and ballads should together show a picture of the army through the eyes of its rank and file soldiers; and through the ordinary people and society in general: a military social history. -An Unpleasant Dream by Thomas. S.
Categories: 1. Special Forces (Military science)-United States-History-20th Century. 2. United States-History, Military. I. Wright, J. R. (Jon R.) II. Title. About this book/synopsis: This book charts the history of America's Army, Navy and Air Force special operations, which have been and are known to be involved with exciting, high-risk, high-profile missions; and it is these activities that are detailed here through gripping, first-hand accounts. Some of these operations have never been described in print before. 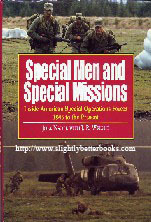 The book includes authentic oral accounts from special operations veterans, official after-action reports and information from other sources, all combined to provide the most detailed and complete history ever of the past half century (looking back from publication in 1994 that is) of special operations such as the U.S. Navy's Special Boat Units and SEAL platoons taking action in Europe, Asia, the Caribbean Basin, Latin America and the Middle East. Army special forces teams penetrated into the jungles of Vietnam to train indigenous tribesmen and conduct direct action missions against Viet Cong political and military structures. The targeted key Cuban activities for attack by conventional forces before Grenada was invaded and during the Gulf War, they provided advice to Central Command as well as being instructors to Arab forces allied to the United States. US Air Force AC-130 Spectre special operations gunships were used to devastating effect against the North Vietnamese on the Ho Chi Minh trail in the 1960s, and in the 1990s, the advanced spectre gunships were used in the 1990s over Iraq wreaking havoc against Iraqi fortified positions. Special Boat high-speed craft and Navy SEAL platoons conducted daring raids agains hostile Vietnamese, Panamanian and Kuwaiti shores in their respective conflicts, carrying out reconnaissance and infiltrating beach defences. About this book/synopsis: The men of the 95th Rifles (as the Rifle Brigade was originally known) produced some of the finest first-hand accounts written about the Napoleonic Wars. William Surtees' Twenty-Five Years in the Rifle Brigade is one of these examplary accounts sitting comfortably alongside other famous memoirs such as those penned by John Kincaid and George Simmons. The book captures the esprit de corps, the initiative, the courage and the glamour of the troop. Sharing the dangers of many a battlefield, Surtees provides valuable eyewitness descriptions of fighting in the Peninsular War. He relates episodes as dramatic as you'd find in the wonderful novels penned by Bernard Cornwell about the legendary Richard Sharpe - fictional hero of the 95th. The feats that Surtees describes are all the more impressive in that they are true. He stood shoulder-to-shoulder with comrades such as Tom Plunkett, a crack shot who helped drive back an enemy advance by getting close enough to shoot dead the French general Colbert. He describes another incident where a sergeant and a few followers crept past a French sentry to seize and break dozens of muskets piled in front of a house before returning to their own lines unharmed. There is also the incredible tale about Daniel Cadoux's stand against overwhelming odds on the bridge over the river Bidassoa at Vera. Surtees also describes his baptism of fire with the 56th Regiment in the Netherlands under the Duke of York in 1799. He was also involved in an abortive expedition into Northern Germany in autumn 1805 and a successful incursion with Sir Arthur Wellesley into Copenhagen against the Danes in 1807. After the Peninsular War ended in 1807, Surtees made his way into North America to fight in the last stages of the 1812-1814 war against America. In this account, his sense of frustration at the mismanagement of all these operations is palpable and he makes some incisive comments on the conduct of the British commanders in America and contrasts their ineptness with Wellington's professionalism in the Peninsula.